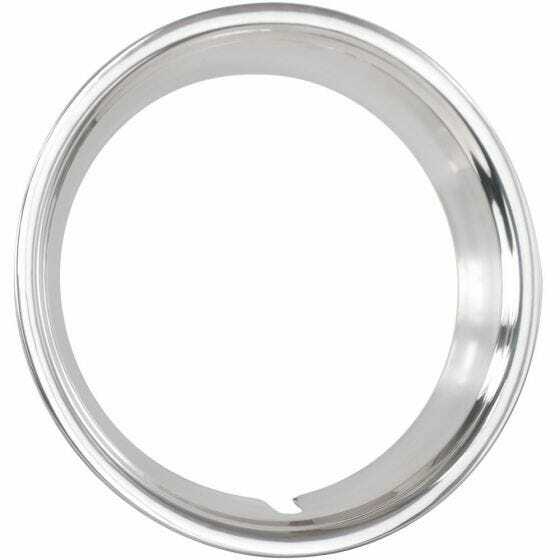 This stainless steel trim ring is 14 Inch x 2 inch round style. 14 inch trim rings offer tons of fitment options in such a popular wheel diameter size. These are common fitments on many OE and custom applications. These steel wheel trim rings feature stainless steel construction with a smooth, rounded profile. These might work. Can you measure and make sure they are 2" wide? The ones I ordered said they were but they were only about an inch and a half. Yes, these are a true 2" in depth. This is close, but is there one measuring 14x2.25? Yes, there is! Click Here Please let us know if you need further assistance. I purchased 14x6 Ralley wheels from Coker, now I need to order trim rings to fit them. What trim rings will fit your rims? Did you order a set of our Chevy Rallye wheels? If so, I am afraid that we do not presently manufacture a trim ring designed to fit. The rings we sell will fit a 14x7 or 14x8, but are too wide for the 14x6.